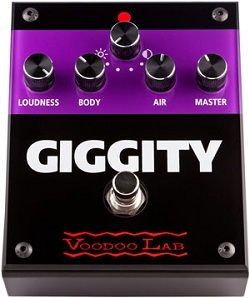 The Voodoo Lab Giggity pedal, the mastering preamp for guitar, featuring controls that shape your tone, is now shipping. This highly anticipated pedal is finally being released by Voodoo Lab in small quantities, with a larger release planned over the coming months. Voodoo Lab say the Giggity isn't just an overdrive or boost pedal. With its unique Body and Air tone shaping circuits, Giggity can help you fine-tune your overall sonic footprint. Placed after your pedalboard and before a clean amp, you can add a little grind, and thicken up the bottom by adding Body. Placed first in the signal chain, you can add Air to bring out the high-end shimmer and detail in your guitar's pickups. Also features a 4-position "Sun" to "Moon" preamp voicing selector to help you dial in the perfect tone. Each pedal is hand built in the USA using high-grade precision parts, and features true bypass switching via a high reliability gold-contact relay. For more information, visit Voodoo Lab.